Grosgrain: Does Baby Powder Really Remove Beach Sand? 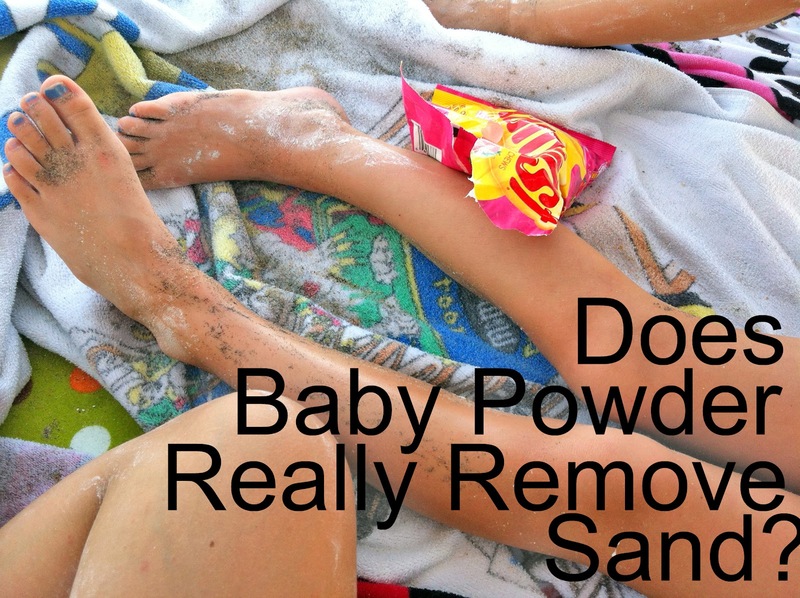 Does Baby Powder Really Remove Beach Sand? So we're back. The house is a mess. I was in such a hurry on Friday I didn't get a chance to clean up before we left. I like to come home to a clean house but not only was it messy last night but also HOT since we had turned off the air conditioner. We had to wait a good two hours for the house to get back to normal. At any rate, I wanted to share some Pinterest experiments we tried while at the beach. Today I'll be letting you know if baby powder really does work at getting all that sand off of your feet. Well....sort of. 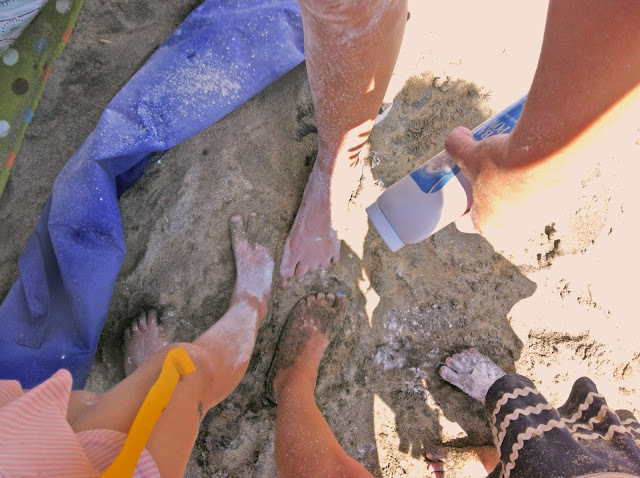 If you're just coming back from the ocean and your feet are wet and have sand clumped onto them then pouring baby powder doesn't really work that well. Maybe it hastens the drying process but mostly you get a white sloppy mess. It helps if you rub your feet together instead of using your hands. See what I mean? HOWEVER, if you sit out for about five or ten minutes and try to apply the baby powder on the areas that are semi-dry it works! It's good for when your hands are moist still attract sand. Although I will say that what you're left with is a lot of white messy powder all over your legs and hands and arms and feet but it feels better than wet sand. What I did was after I had dried for a little I got the sand off with the baby powder then I used a wet wipe and wiped off the baby powder. Of course, the wet wipe made me a little moist but I stayed on the beach blanket until I thoroughly dried and ultimately I got the sand off faster than without the baby powder. So my recommendation would be to bring it along. It doesn't work miracles but it certainly helps! Stay tuned for a ribbon sculpture tutorial later today! Huh. Leaving baby powder on the beach doesn't seem all that eco friendly. Maybe I'm wrong? We've always just waited until we got back to the car and then brushed the sand off our feet with the towel, because by then it's completely dry. I've been using the baby powder for about 2 years now. Love it. I wait until we are done walking through the sand and in the parking lot before use. Try to keep as much sand as possible out of the car. @AudreyWe used cornstarch baby powder which (I believe) is more natural since it's made from corn kernels. It's also more absorbent than talcum baby powder but it cakes more easily. I wonder if plain old cornstarch would work at all? Talc is a mineral, so I don't think it's so bad leaving it there in the sand with the other minerals. I'd take it over the other detritus any day. I was just talking to a friend about this today. Baby powder (talc) is great for removing those stuck on grains of sand that just seem to stick even when they are dry. I live near the beach and have found it the best way of de sanding my children before getting back in the car. If we are walking home - they just have to keep bruching the sand off. speaking of which I still have sand between my toes - now where's that talc? If you are concerned about eco-friendly behavior... People take literally tons of sand away from beaches every year. So maybe it isn't so bad if we leave the sand and a little powder behind. ;) Plus, depending on brand, baby powder is considered an "enviro-safe" product. We have sand under the playground in our backyard and use it by the back door. We also use it at our church for the nursery kiddos. We are nowhere near the beach... someday! The absolute best thing to get that pesky sand off your body is a wide paintbrush....you'll never use anything else!